Viruses that have the ability to lie latent within a cell have two options when infecting a cell: they can either enter the latency or the lytic pathway (productive replication). The decision between lytic and latent pathways is regulated by expression of regulatory proteins part of a genetic switch system. The outcome of the followed pathways depends on the ratio of these key regulators in Lambda. This ratio may be determined by environmental factors such as the host cell type, its shape, or the nutriment availability. Bacteriophage lambda includes at least a repressor of the lytic promoter, a repressor of the latency promotor and two key regulators . Mu phage switch system involves two proteins, a repressor of early promoter called RepC and a repressor of RepC expression called Ner. 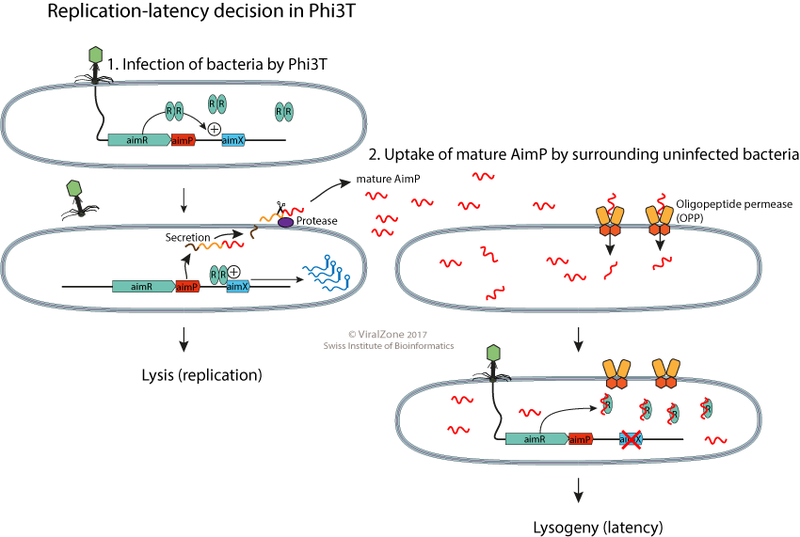 In phi3T bacteriophage, the decision between latency and replication depends on the concentration of a small peptide that is secreted by infecting viruses and an intracellular receptor that acts as a transcriptional regulator. When a virus infects an as-yet-uninfected bacteria in which the peptide has accumulated, latency will be promoted.